We are pleased to announce a new season of WATER interns. 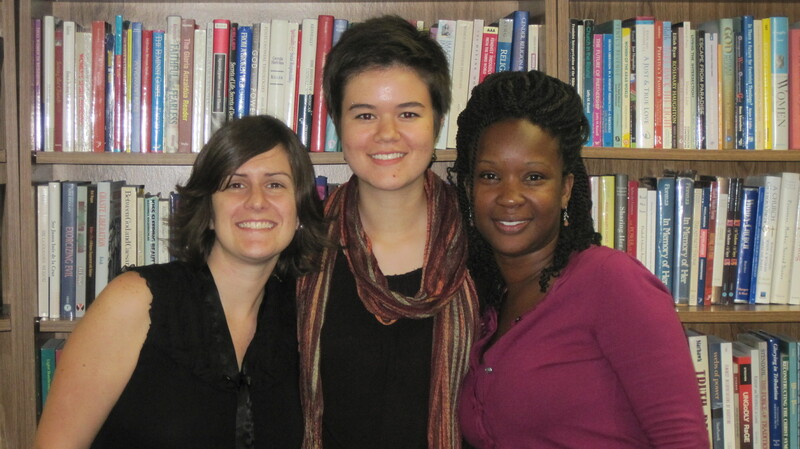 Anne joins the staff as our new Loretto Volunteer, and Heather and Clarafrancie come to us from Wesley Theological Seminary. They’re a fantastic bunch and we look forward to the year ahead. Stay tuned! As the seasons change, we look back on the summer with joy and inspiration. 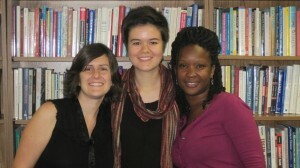 Get to know our 2011 summer interns and our intern program, Women Empowering Women, by reading their letter below. Greetings from WATER, where we are surrounded by the presence and legacy of so many, including you.Your support has made it possible for us to come from Austin, Seattle and DC to spend the summer in the WATER office, where the walls are lined with feminist resources and our desks are piled high with grant proposals, bibliographies, and historical archives from WATER’s 28 year history. Our work is rooted inrelationships and feminist values. Our rich experiences embody WATER’s aptly titled internship program, Women Empowering Women. Mary Hunt often speaks about Mary Daly to us, regaling us with stories and passing along Mary Daly’s good advice to “Throw your life as far as it will go.” The unique and dynamic spirit of WATER makes this the right place to receive such advice. Risk taking and courageous acts have nourished and propelled the work of WATER since the beginning and we are honored to participate in this legacy. What a summer! her year-long internship which has been sponsored by the Loretto Volunteer Program. She is transitioning back to the Pacific Northwest and will be joining the staff of the FaithTrust Institute, a sister organization founded by Marie Fortune. Y. Joy Harris is working on her Ph.D. at Howard University where she will continue to investigate the intersections of religion, communications, and culture. the work of WATER and we are grateful to be connected to you through such a meaningful Alliance.